﻿ Car Safety Ratings: What are the Safest Cars 2017? Did you know headlights can make all the difference in determining whether a vehicle earns the best car safety ratings? Chances are, you don’t think much about your headlights. They sit on the front of your car, they light up, and sometimes you have to change the bulb. But for the first time in 2017, the Insurance Institute for Highway Safety (IIHS) requires an acceptable or good headlight rating in order to award its top car safety rating: Top Safety Pick+. This designation means a vehicle earned good ratings in the IIHS’s tests for front and side crashes, roof strength, and restraints/seats, plus an advanced or superior rating for front crash prevention. One tricky thing with these ratings is the consideration of optional equipment. A lot of vehicles receive the best car safety ratings only when they’re equipped with high technology car features like forward collision warning, lane departure warning, rear-view cameras and automatic emergency braking. When you’re driving one of the safest cars, make sure your car insurance is doing a good job of protecting you, too. Get multiple car insurance quotes in minutes, then lock-in your price and buy the best insurance for you. The Chevrolet Volt is small but mighty. 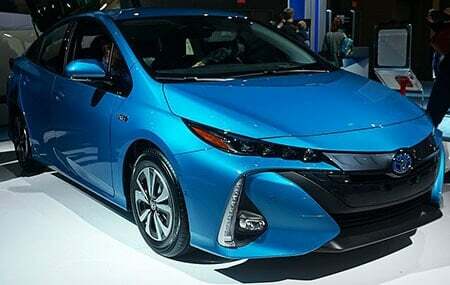 It travels up to 53 miles on a single charge before the gas engine kicks in. The 2017 Volt gets a superior rating for front crash prevention when equipped with optional Front Automatic Braking and Low-Speed Front Automatic Braking. The Elantra gets great safety ratings across the board for models built after March 2016. That’s when the car structure was reinforced and the front airbag was modified to better protect the driver in small overlap crashes. There’s a big difference in safety between the two available headlights, however. The HID projector lights got a good rating, while the halogen lights were rated poor. The 2017 Prius gets the best car safety ratings even without optional technology. That’s because all models come standard with the Toyota Safety Sense package, which includes a pre-collision system with pedestrian detection, lane departure alert with steering assist, auto high beams and full-speed dynamic radar cruise control. The Honda Accord has always been good at marrying style and safety, and the 2017 model gets top safety ratings when equipped with the optional Honda Sensing package. Once again, headlights make a difference. The IIHS says the halogen lights are acceptable, but the LED projector lights earn a marginal rating. This sporty sedan is also one of the safest midsize cars, earning a Top Safety Pick+ rating for 2017 with optional front crash prevention. In the Mazda6, this crash prevention technology is called Smart City Brake Support, which helps detect objects ahead (at low speeds) and enables sudden braking by moving brake pads closer to the disc. The IIHS gives acceptable ratings for the available LED headlights, but only marginal ratings for the halogen lights. 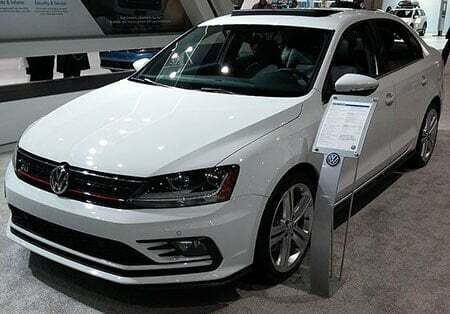 The 2017 Jetta earns the Top Safety Pick+ rating with optional Front Assist (with Autonomous Emergency Braking). Opt for the HID projector headlights over the halogen reflector lights, which earned only a marginal rating. The only bad thing Car and Driver notes about the 2017 CR-V is its “ubiquity” and “anonymity.” But it’s not surprising that everyone drives one, because this SUV is sleek, a gas-sipper and safe. Equipped with Honda Sensing and LED reflector headlights, it’s one of the safest small SUVs. The Outlander is a budget-priced SUV with three-row seating for up to seven passengers, making it a great family get-around car. And it gets excellent car safety ratings, as long as you opt for the Touring Package that has a Forward Collision Mitigation System and LED projector headlights. The 2017 Toyota RAV4 Is a Top Safety Pick+ when equipped with LED headlights — and it’s a pretty fun little SUV, too. 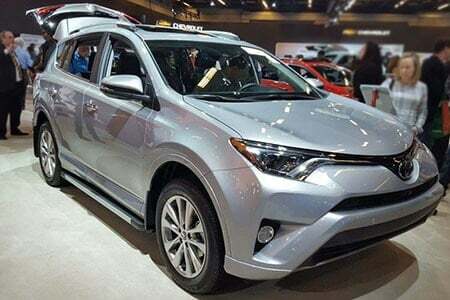 All RAV4 models come standard with Toyota’s Star Safety System. That means you get enhanced vehicle stability control, electronic brake-force distribution, brake assist and Smart Stop Technology. (This last feature sounds hi-tech, but it’s pretty basic. When you accidentally press the brake and accelerator pedals at the same time, it brings the car to a stop).